Photo: D.L. Mundy, . Toitū / Otago Settlers Museum. 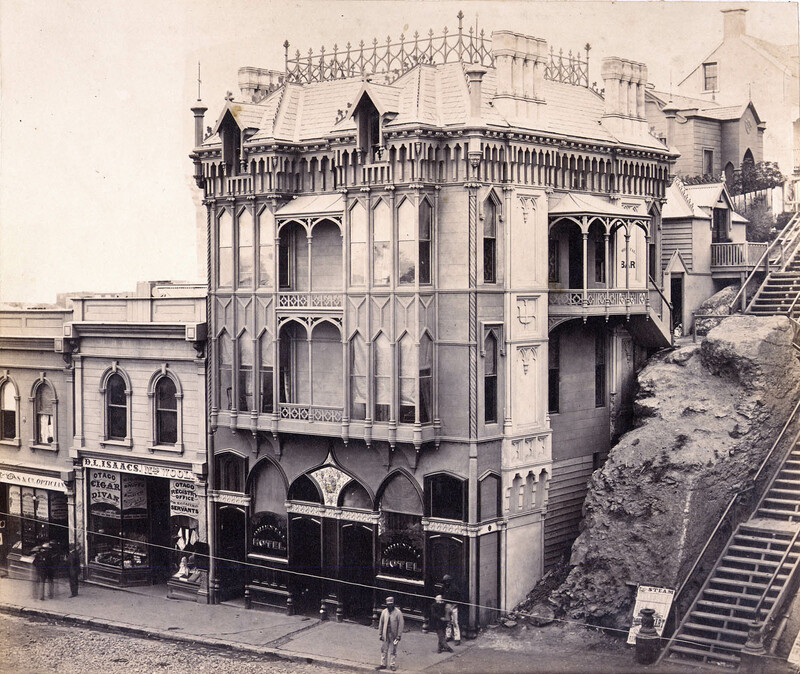 The Oriental Hotel was the most exuberant building of gold rush Dunedin. Dominating its neighbours, it magnificently thumbed its nose at any stodginess or dourness that might, fairly or unfairly, have been associated with the established settler society. The eccentric four-storeyed timber structure was built for John Sibbald in 1863, with construction reported as nearly complete by December that year. The following month Harriet Cooper was given a license to run the hotel. The design of the Oriental was so eclectic that it has been variously described as Gothic, Continental, Renaissance, Old English, American and, yes, Oriental. It even had ironwork with shamrock motifs. 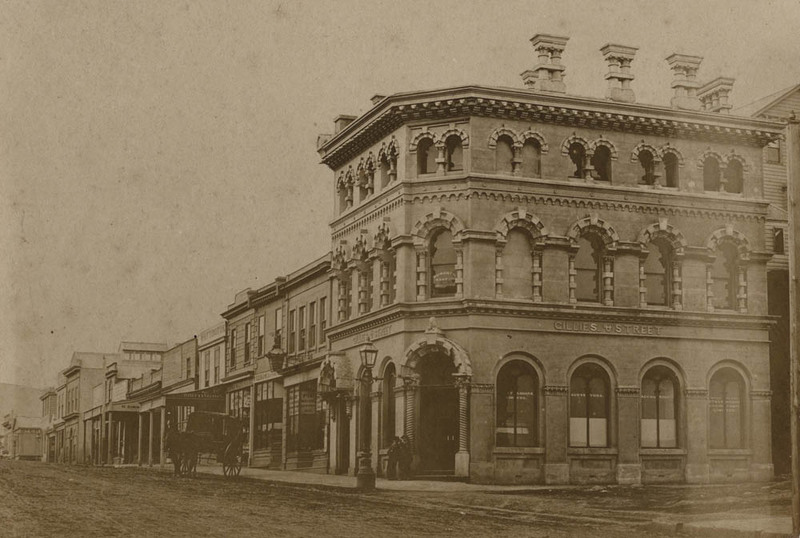 The Otago Daily Times struggled to describe the building in 1864, but referred to it is as ‘very pretty’ and an example of what might be termed ‘Continental Gothic’, a departure from the ordinary Gothic style. 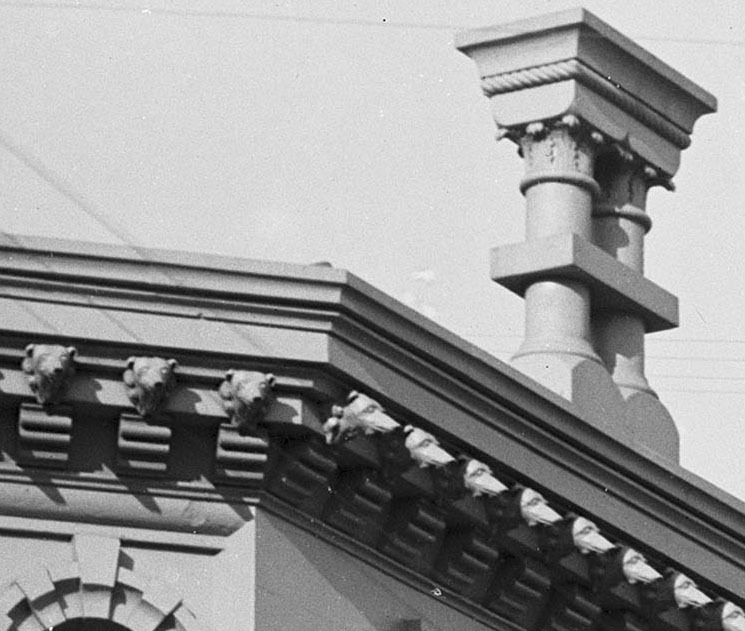 The great variety of detail included barley twist columns, grotesque heads, a representation of Bacchus, balcony stick work, Tudoresque chimneys, oriel windows, gablets, an elaborate and unusual cornice, and a platform with iron railings on the top of the building. No Asian influence was mentioned in the report and I haven’t found any evidence explaining whether or not the hotel name was chosen before or after the building was designed. Stacpoole and Beaven (1972) noted that the oriel windows with connecting balconies, along with the cornice, were ‘as far East as Gothic could go’. A contextual view. 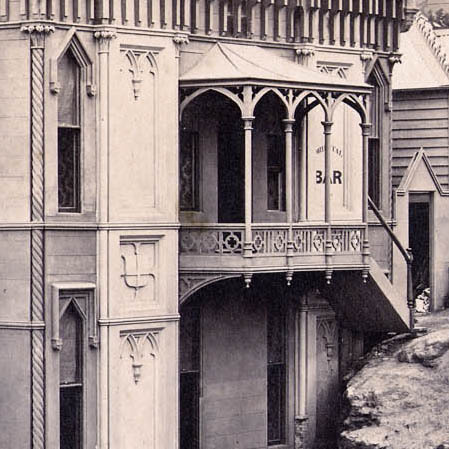 Note the Dowling Street steps where the land was excavated in the 1880s allowing the extension of the street. Photo: 1865. Alexander Turnbull Library. Ref: PAColl-3824-04. 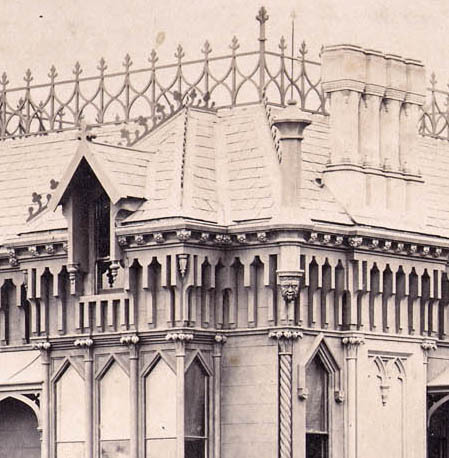 The question of who designed the building has long been one of the puzzles of Dunedin’s architectural history. Some sources name Edward Rumsey as the architect, an attribution that seems to have originated with Stacpoole and Beaven (1972), based on stylistic grounds. Rumsey probably arrived in Dunedin aboard the Aldinga in June 1862, although he did not start advertising in local newspapers until August 1864. It is possible that he was the designer. I have a new theory, which is that W.H. Clayton designed the building. 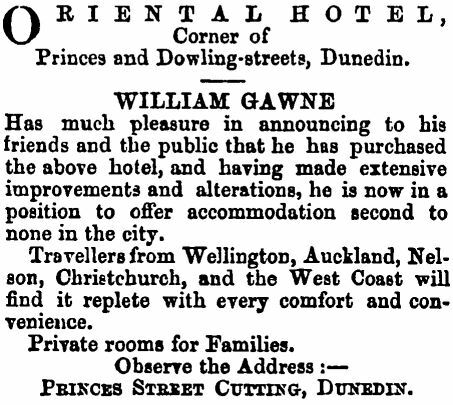 Clayton worked in Dunedin from May 1863, and of all the architects working in Dunedin at the time he is the only one I know of whose style appears at all consistent with the Oriental. 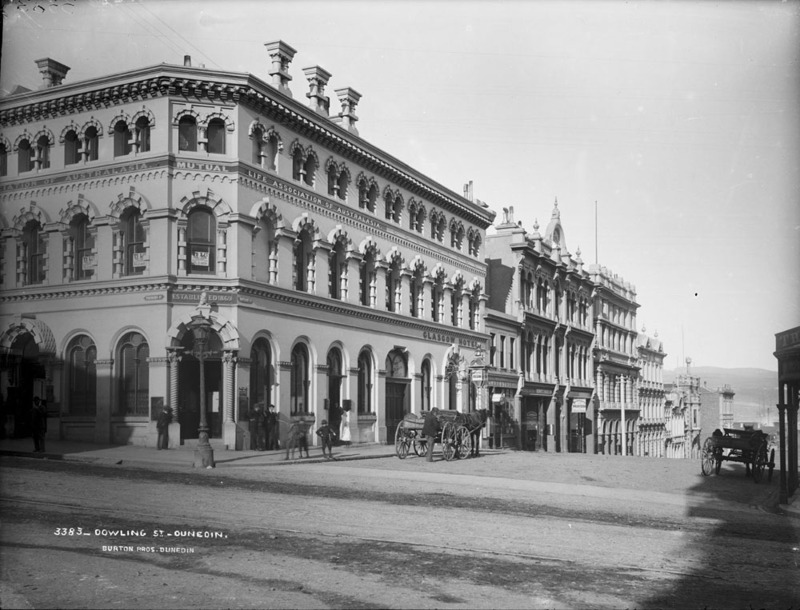 Clayton later became Colonial Architect and he designed many public buildings throughout the country, including the Old Government Buildings in Wellington. There are particularly striking similarities between the Oriental and his unrealised concept drawing for Government House in Wellington (c.1869). After searching newspapers online, on microfilm, and in print, I found only one piece of documentary evidence to support this: in August 1863 Clayton called for tenders for ‘Lowering an Hotel to the permanent level’. It was at this time that the section of Princes Street known as the Cutting, in which the Oriental was built, was lowered to the line of the rest of the street. Was the Oriental the hotel referred to in the tender notice? W.H. 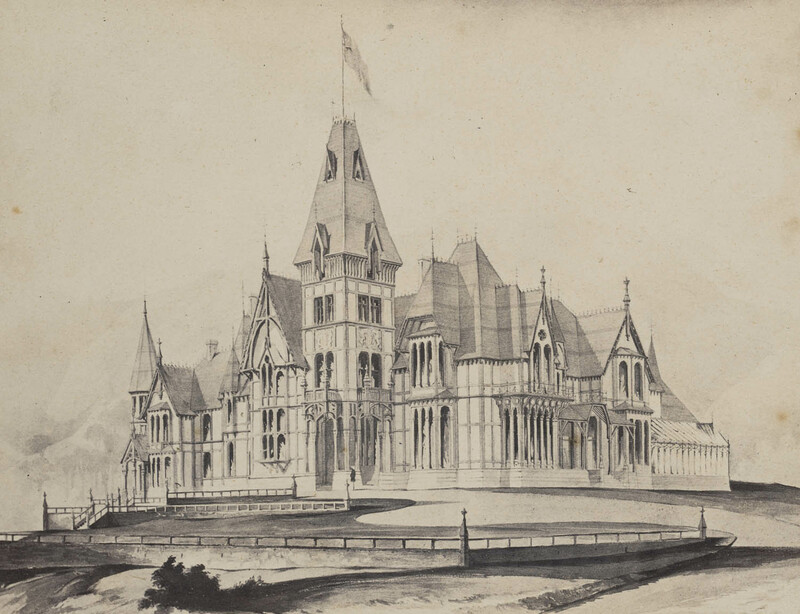 Clayton’s unrealised design for Government House, Wellington. Image: c.1869, Alexander Turnbull Library. Ref: PA1-q-158-42. 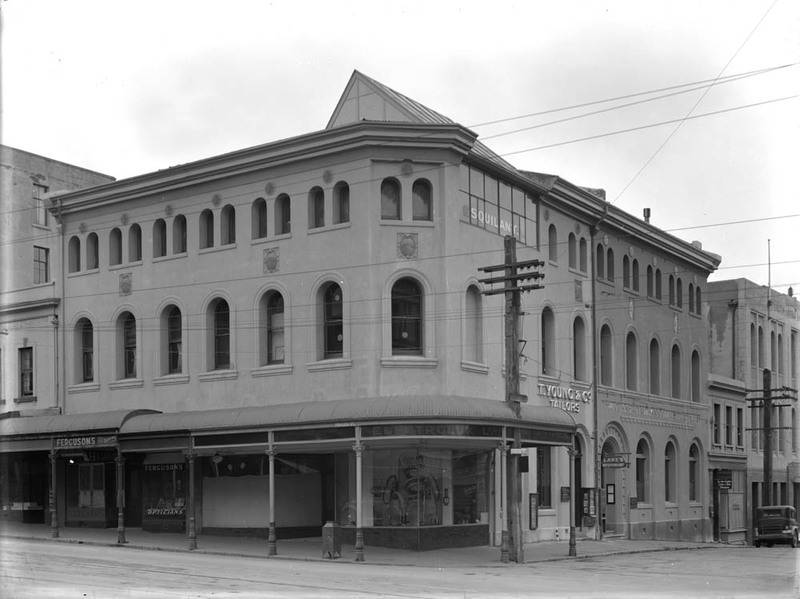 The Oriental was one of Dunedin’s larger hotels. It had a bar and a restaurant, and was the venue of lodge meetings, coroner’s inquests, the organisation of walking races, and its fair share of disorderly behaviour. 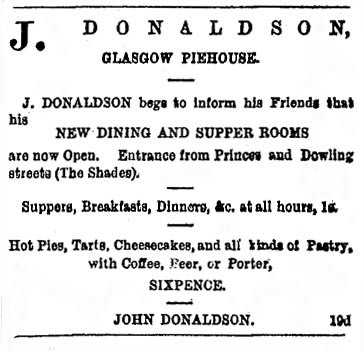 It was a mostly respectable establishment, however, and its accommodation included ‘private rooms for families’. 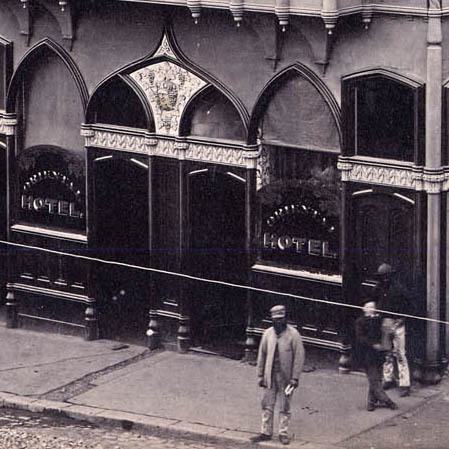 In 1883, an English artist who had toured New Zealand described the hotel as ‘rather of an American type, and, I must say, the most elegant building of the kind I have seen since leaving San Francisco’. Advertisement from the New Zealand Tablet, 4 August 1876 p.17. National Library of New Zealand. 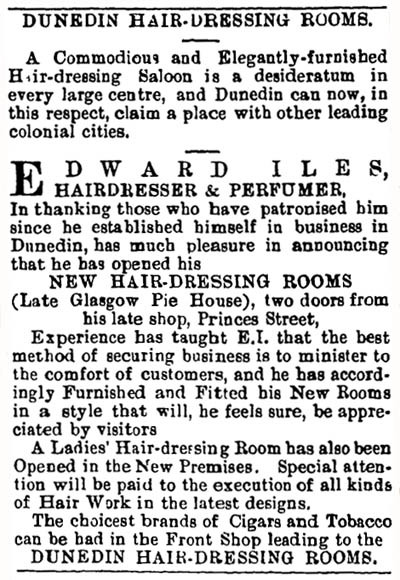 Advertisement from the Otago Witness, 18 September 1880 p.4. National Library of New Zealand. 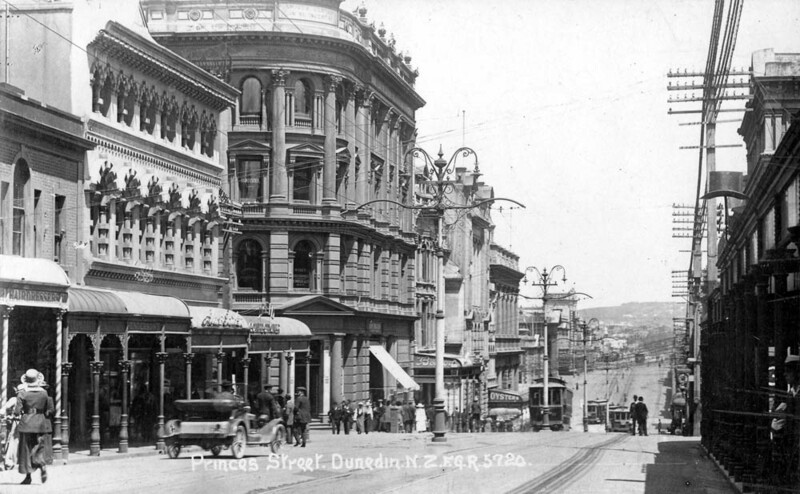 In its early years Princes Street was plagued by fires, which sometimes swept through entire city blocks. Deaths and great loss of property were experienced, and it’s unsurprising that wooden buildings came to be seen as a liability, and that more fireproof brick construction was promoted on safety grounds. Earthquakes were not experienced, and so they were not factored in. The Oriental nearly burned down on no fewer than four occasions (1865, 1880, 1883, and 1885) and at the time of its demolition in 1887 it was described as a ‘standing menace’. The land was very valuable, and in 1874 the freehold had been purchased by Joseph Braithwaite (the well-known bookseller and later mayor) for the princely sum of £1,850. After much blasting and excavation, Dowling Street was extended and the Excelsior Hotel was built on the site of the old hotel (taking its license). That building still stands today, but its story will have to wait for another post. 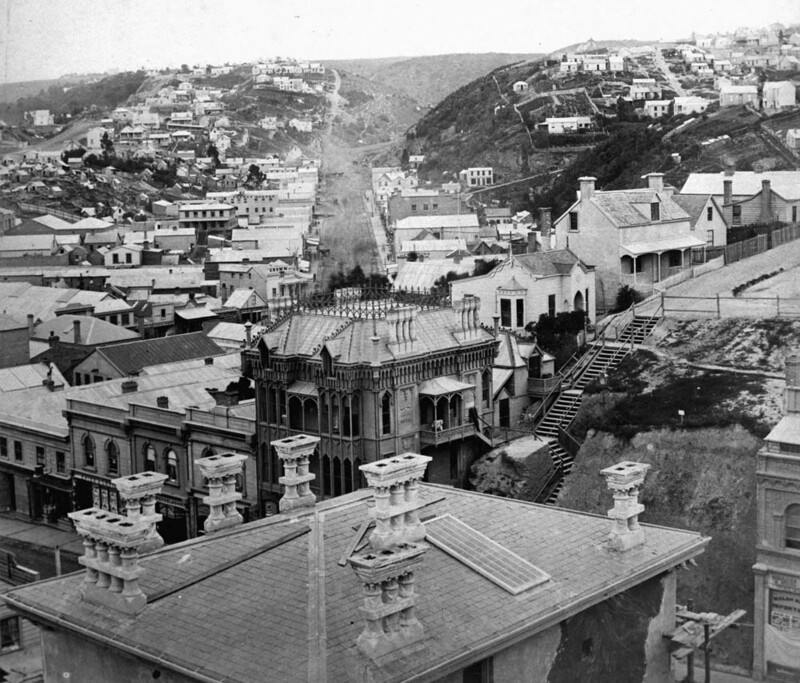 Otago Daily Times, 20 August 1863 p.3 (Clayton tender notice – reducing hotel to permanent level); 18 December 1863 p.3 (description), 10 February 1864 p.7 (lost cockatoo), 30 May 1864 p.3 (Cooper insolvent ), 1 June 1864 p.3 (Sibbald), 12 May 1874 p.2 (sale of freehold), 15 May 1880 p.2 (fire), 23 March 1883 p.4 (impression of architecture on visitor), 28 November 1883 p.2 (fire), 2 June 1884 p.1 (Stanbrook advertisement), 10 June 1885 p.2 (fire), 9 March 1887 p.2 (demolition), also various Licensing Committee reports; The Mercury (Hobart), 11 February 1865 p.3 (fire – walls blistered); Otago Witness, 18 September 1880 p.4 (O’Kane advertisement). Stacpoole, John and Peter Beaven. New Zealand Art; Architecture 1820-1970 (Wellington: Reed, ). Tod, Frank: Pub’s Galore (Dunedin: Historical Publications, 1984). Willett, R.W. 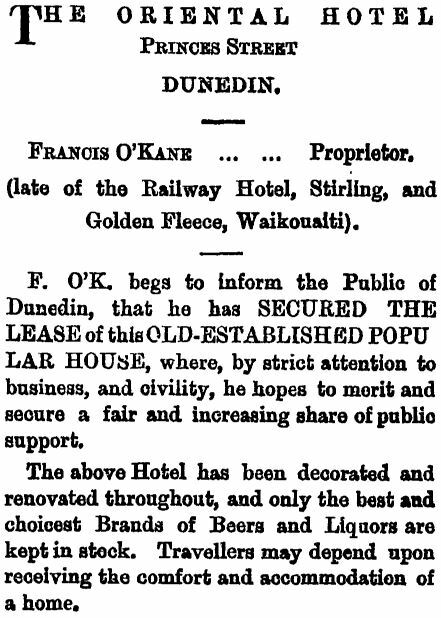 Hotels of Dunedin; Historical Record (Dunedin, 1937). Photo (detail): D.L. Mundy, . Toitū / Otago Settlers Museum. 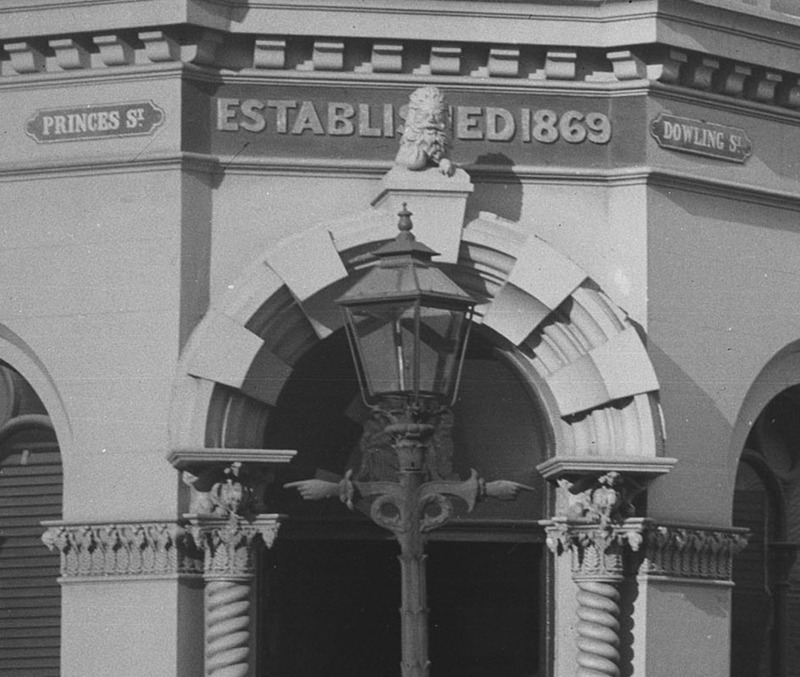 This entry was posted in Buildings and tagged 1860s, Edward Rumsey, Hotels, Lost Dunedin, Princes Street, Timber construction, Victorian, W.H. Clayton on 24 February 2013 by David Murray.